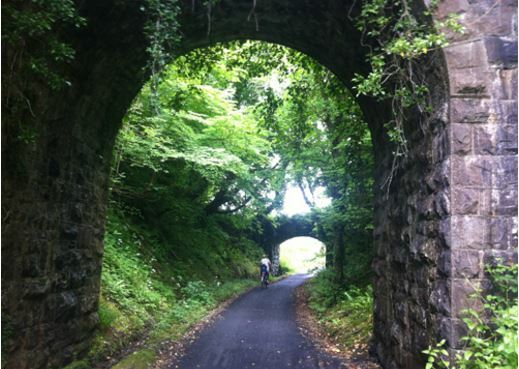 “Walking is the most sustainable form of transport” states the Irish Design Manual for Urban Roads and Streets. Researchers, however, point out that cycling is the most efficient — and even uses less than half the energy as walking, when cycling is faster (see here or here). Electric cars are not shown on the image, but they cannot compare to cycling. 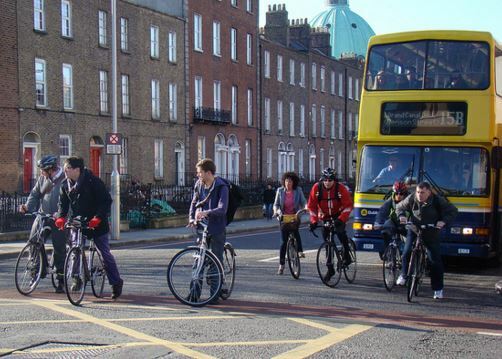 One Irish study on transport emissions showed that fully-loaded peak-time Dart trains come close, but do not even match the humble bicycle. Both for people to take up cycling, and for the Government to invest in high-quality cycling networks, there’s more than a few reasons why cycling has benefits for individuals, the state, and for business. When there’s a network of high-quality cycle paths in place, then cycling can be seen as a mode of transport which is: cheap, fast, convenient, healthy and fun. “Good for environment” is a low-level selling point to Dutch or Danish people who cycle on mass — the same is likely to be the case in Ireland. But when are roads and streets are retrofitted, there’s many selling points to convince people to cycle. Topping the list of benefits are the many health effects for individuals and for the health system — active travel builds exercise into people’s daily life and helps prevent obesity, heart disease, some cancers, and some mental health issues. A close second and possibly the top economic reason for cycling is the congestion tackling benefits — our towns and cities just don’t have the space for continued mass car use. 8km is likely towards the higher limit for most people commuting by bike, but people will travel further on high-quality, uninterrupted routes (like greenways along canals, rivers and bays done right). Some people are also willing and able to go further and faster on conventional bicycles, and a wider range of people to do the same on electric bicycles which can make longer distances more attractive by bicycle. A key example of low hanging fruit in attracting people who don’t cycle to cycle at least some of the time is residents of the inner suburban areas of Dublin (basicly between the M50 and the canal cordon). We’re talking about 738,000 people in a relatively small area, traveling mostly short distances, and most of them still mainly drive. Dutch cycling experts point out that you don’t just need a good cycle path or two to get people to switch, but you need a high-quality network of safe and convenient routes. Dublin is way behind on building such a network which is segregated and attractive — and there’s signs that design failures of the past are being replaced by new design failures. Higher investment, design improvements and political will are all needed. Above is a chart which we have used before and are likely to use again and again. 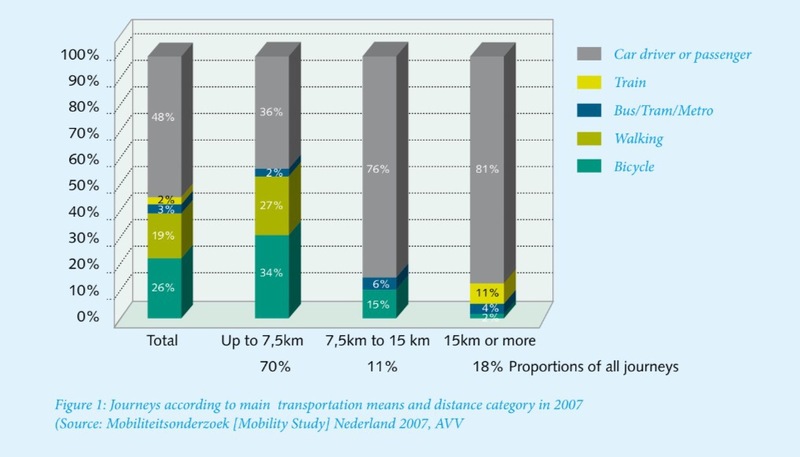 It’s from a Dutch government report ‘Cycling in the Netherlands’. Looking at the total (left column) we see that share of the Netherland’s many train, tram, bus and metro services nationally amounts to just 5% of total trips. Walking amounts to 19%, while cycling amounts to 26%. When it is argued that we should follow the Dutch, we’re often told we’re too far behind. While we are far behind, we’re even further behind in public transport provisions. However, catching up with the Dutch public transport system alone (in relative terms at least) would not any meaningful impact on emissions compared to catching up on their cycling infrastructure and culture. We argue that public transport and cycling supports each other and investment is needed in both, cycling just needs a larger chunk of the overall transport spend. When cycle routes and bicycle parking is provided, people will cycle to public transport far further than they will walk to the same train or bus stops and stations. But sometimes large investments are needed in secure parking. 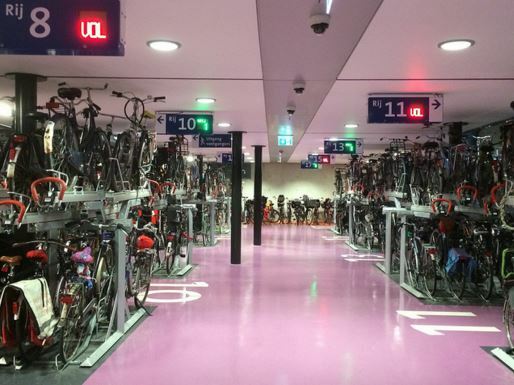 Take, for example, the Dutch city of Utrecht, a city smaller than Dublin, but one which is constructing 22,000 bicycles spaces at its central train station. In the Netherlands it is common to have bicycles at both ends of journeys — allowing people to travel to/from stations faster. This makes high-frequency rail and bus options more attractive to more people, thus more viable to provide. Cycling and driving are both mainly door-to-door modes of transport; the idea of freedom and independence is strong with both modes, and, while bicycles can’t hold as much as a car, by using Dutch-style bicycles with pannier bags and baskets/crates you can carry a lot more than walking and using public transport. With bicycles, like cars, you’re not tied to timetables or traveling to the nearest public transport stop. While the best value for public transport are monthly or annual tickets which lock you into using public transport daily or the tickets won’t be worth it. Cargo bicycles are suitable for transporting children and “last-mile” transport of goods and deliveries. These bicycles help people in cities to go or remain car-less or sell their a family’s second car. An EU-funded project estimated that 25% of all goods and 50% of all light goods could be moved by bicycles in urban areas. Cargo bicycles have increased in popularity for personal and business use in Europe and North America. 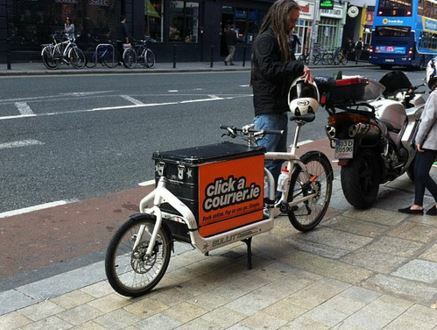 It’s mainly two Dublin retailers (the Dutch Bike Shop and Greenaer) who sell them in Ireland, but their use is still at early stages here. 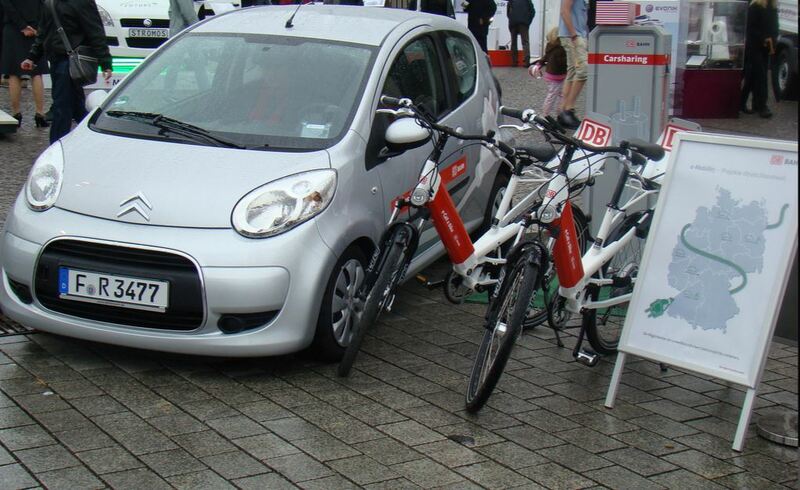 Why subsidise electric cars but not cargo bicycles or electric cargo bicycles? We need to retrofit our roads and streets to cycling — but there’s overall little funding made available for this, councils are restricted because of staff shortages and in some cases also because of budget shortages, and our national design guidelines still fall far too short of best practice (ie what the Dutch do). We have tried long enough to do it our own way (partly copying the UK), it’s time to follow the leaders. The Netherlands is only 1,000km away and we have a lot to learn from them from political will to funding to design and construction standards. But that’s not the only reason why electric cars are not an answer to the problems we face. Subsidising electric cars for non-shared private use negates to account of an immediate issue most of our towns and all of our cities are facing — congestion. Cars are clogging up our cities more and more to breaking point — it takes very little to send the network into gridlock. Electric cars will only make this worse. As far as emissions are concerned, lowering emissions via fewer car trips by getting car owners to switch to mostly or sometimes using bicycles is achievable in the shorter term on a larger scale than a switch to electric cars. All very good points, well presented. 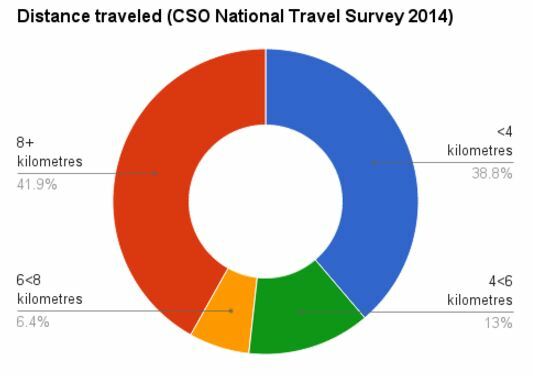 Unfortunately the psychological inertia towards switching to non-car based travel is massive in this country. 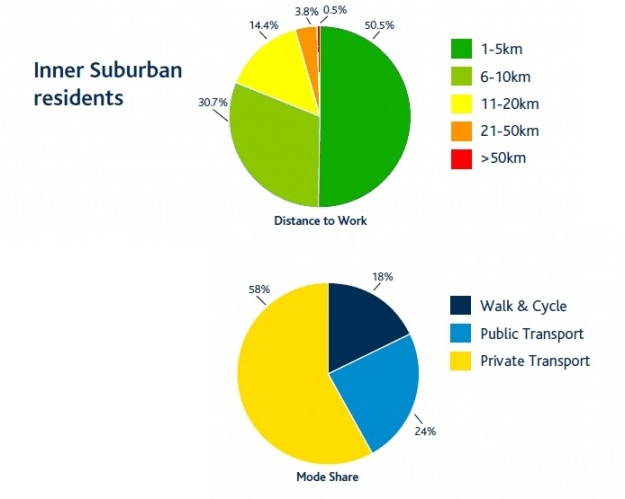 Even people who are favorably disposed towards cycling, because they understand the problems with cars, even those people come up with reasons why it’s unsuitable for THEM to switch – they have children, how would they get to work, they don’t have the time, the weather, they wear a suit to work and blah blah blah ad nauseum. Thank Odin that the Netherlands exists because I can point to the Dutch and say that they do it. I used to live in Utrecht and people cycled even if they had 3 kids hanging out of them. Bankers, and teachers, and business people all cycle in their suits and smart clothing, in the rain, in the snow, in the wind. They can do it and so can Irish people. A really big problem for getting people onto bikes here is, as you say above, due to the lack of well-connect, easy to use, safe cycle-ways. Not cycle ways that require the cyclist to go around lamp-posts in the middle of the cycle line, or cycle lanes that go no-where (eg the ridiculous one that ran up the R139 years ago and ended at a motorway! ), or cycle ways that require the cyclist to dismount or give-way at intersections. For the love of Jebus, if any city councillors are reading this, please, please start planning and building a network of proper cycle ways. The difference it makes to the quality of life can’t be explained. It’s something you have to experience, and when you do, you enter a state of perpetual frustration that other people think the car-centric status quo is the best way to run a city. We need to tackle people’s horror of hills. And we need role model cyclists. And we need a superb network of separated cycle lanes. And we need to end bicycle theft.